Yongjusa Temple is 5-minutes walk away from Yungneung (the joint tomb of King Jangjo and Queen Heongyeong) and Geolleung (the joint tomb of King Jeongjo, the 22nd ruler of the Joseon Dynasty, and Queen Hyoui). 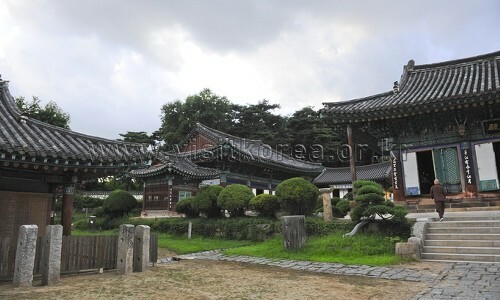 The temple was built by King Jeongjo to protect Hyeollyungwon (현륭원), the tomb of his father, Crown Prince Sado. 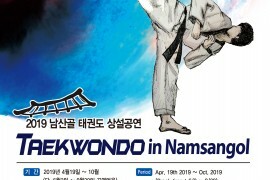 This site was originally the location of Garyangsa Temple, which was constructed in AD854, the 16th year of King Munseong of the Silla Kingdom. The temple was very famous as it was surrounded by beautiful mountains and crystal clear waters. However, the temple was destroyed by fire during the Byungjahoran (the second Manchu invasion of Korea). During the Joseon Dynasty, King Jeongjo moved the tomb of his father, Crown Prince Sado (or posthumously designated King Jangjo), to this spot, and built Yongjusa Temple here to pray for the repose of his father’s soul. It is said that one night before the temple was completed, King Jeongjo dreamed of a dragon ascending to the sky holding a magic ball in its mouth. 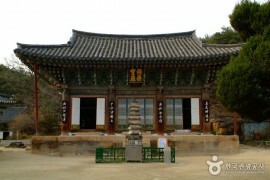 He therefore named the temple “Yongjusa”, which means the temple of a dragon with a magic ball in Korean. The courtyard of the temple contains Beomjong (the Sacred Bell of Yongjusa Temple, National Treasure No. 120), a stupa (stone pagoda), Daeungbojeon (the main hall) and Cheonboru Pavilion. Visitors to Yongjusa Temple can also find the “Bumoeunjunggyeong (부모은중경)” books, which were written by King Jeongjo on the subject of filial affection and respect for one’s parents. These days Yongjusa temple and the Yungneung and Geolleung tombs are highly valued for their cultural heritage.